MINOCQUA, Wis. – A muffled buzz rouses me from my coffee. A fleeting vibration outside the window. It vanishes before I recognize the sound. I wait. I watch. 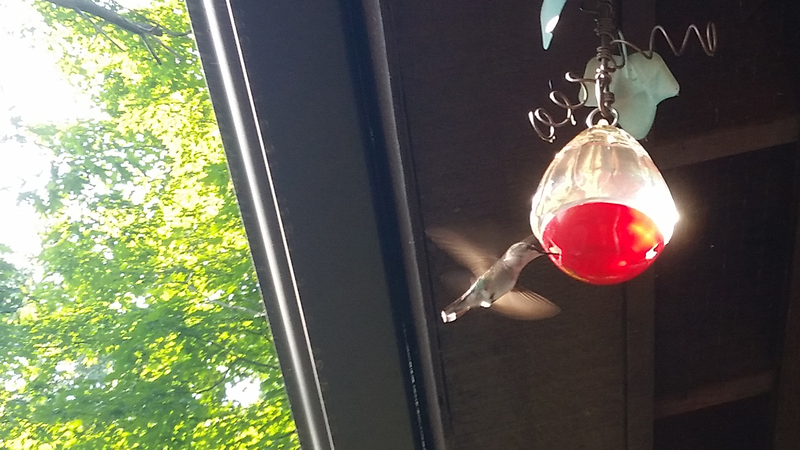 A hummingbird approaches the feeder. Beyond it, the sun climbs over the lake, dissolving the morning mist to unveil a glass table set with three loons. Vacation Up North with my family has taken me out of my workaday world and inspired me to ponder my sense of place. Our youngest daughter is beginning her senior year in high school. A year from now, Mary and I could be empty nesters. We consider ourselves years from retirement, but we have begun talking about where we will live next. Most articles advise writing down your personal priorities, using published lists to locate possibilities and narrow your choices and finally ensconcing yourself among the finalists – living like a local to get a feel for a place before you make any financial commitment. One sign of the times: I’ve noticed more publications suggesting a review of prevailing political partisanship in an area to make sure that you’d feel comfortable there. Often low down on lists of factors to weigh is what you plan to do in retirement. I would think that would be one of the first considerations. My use of days off helps me imagine how I’ll bide my time after I retire. At the cottage, I have been reading, walking, canoeing, swimming, barbecuing, washing dishes and not shaving. I have been enjoying my family. As well as the hummingbirds. I marvel at how skittishly nimble they are, how they flirt with flowers and the feeder, occasionally chittering at one another, hovering and whirring like the spacecraft that propelled the Jetsons. I’m cynical about those Best Places lists for the same reasons I wouldn’t have my daughter rely on those Best Colleges lists to decide where to study. Usually, after you scrutinize their fine-print methodology, you realize that the lists favor values that don’t mean as much to you – or they don’t provide the whole picture. For instance, taxes are a frequent emphasis, but the lists often gloss over additional fees required for services that elsewhere are funded by taxes. Of course, affordability is key. As we get closer to retirement, Mary and I will have to compare what we currently spend on housing with how much we can manage on a retirement budget. Then we can determine how many places we’ll have, whether we’ll own or rent and where we’ll call home. As an alternative to the Best Places lists, I’ve taken a few online quizzes. They have their own limitations, but they force you to pick your preferences among multiple choices, so it’s more of an exercise. Personality Quiz: Where Should I Live in Retirement? I’m ignoring the quiz results (My ideal locations included Tucson, Ariz.; Burlington, Vt.; and Lake Chapala, Mexico. ), but the decision-making process is stimulating. The cottage has been in Mary’s family longer than she has. It is her favorite place on earth. Ditto for our daughters. We haven’t been together here for years – cavorting on the lake, wandering through the woods, crooning show tunes around the piano, competing in family-fraying rounds of dominoes. The only plan each day is what’s for supper. Although we cherish the place and expect to have access to it for the rest of our lives, it wouldn’t be a year-round Eden for Mary and me. It’s too isolated for us, and – aside from occasional ski getaways – the winters would be too harsh. As it turns out, retirees move less than I thought. According to the U.S. Census Bureau, only 13.5% of Americans 65 and older moved between 2010 and 2015; only 2.8% of them moved out of state. I imagine Mary and me staying put. We enjoy the walkability of where we live, the evolving diversity of our neighborhood, the proximity to family, friends, transportation, recreation and entertainment. I can see us downsizing down the road and using the colder months to explore warmer climes in the U.S. and abroad. We’d become snowbirds – not unlike the hummingbirds, which already have begun migrating to Mexico and Central America, where they’ll fatten up for another spring return to their breeding grounds Up North. As with so much in life, though, we can only plan and prepare. Health events, family situations, economic uncertainty, meteors from outer space and other unforeseen circumstances beyond our control can influence when, how, why and where we retire. Best Cities for Successful Aging, by the Milken Institute Center for the Future of Aging – Not a guide to best cities for retirement as much as a thoughtful examination of communities that contribute to graceful longevity.